Remember a phone named Redmi Note from Xiaomi that landed in India many many months ago? First came a 3G dual SIM version that was a hit but then banned by the Supreme Court but Xiaomi was quick to bounce back with the single SIM 4G version which continued to be a hit. This phone set a new trend – the 5.5″ mindranger segment coming in at around the 10K INR mark. YU Yureka, Honor 4X, Meizu M1 Note, Lenovo A7000 and the list goes on! While others had one or more issues ranging from minor to major, the Redmi Note 4G went on to be a rock solid phone with the best in class camera and best battery performance along with a very stable MIUI v6. Of course competition caught up and ate way into its market share and sooner or later Xiaomi had to bring the next version. 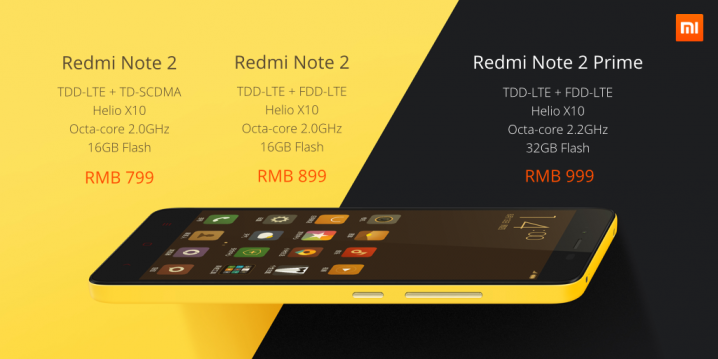 That is what happened today – Xiaomi in China officially unveiled the successor in the form of Redmi Note 2. Well, not one but 3 variants! Xiaomi Redmi Note 2 comes with the same size of 5.5″ screen but this time around it will be a FULL HD display with a resolution of 1920*1080 pixels. What is special about this screen is the fact that its minimum screen brightness goes down by 10x while used in the dark / night hours with the luminescence going down to as low as 0.5 cd/m2. This will be very forgiving to the eyes. The overall form-factor too has taken a change to become thinner and lighter while its predecessor was bulky and heavy and this was a deal breaker for many. 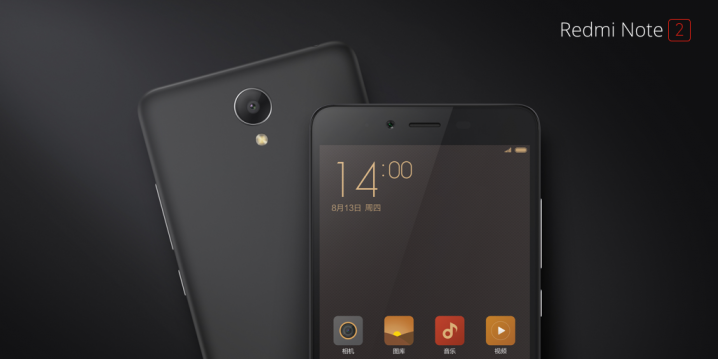 At a quick glance from the side it almost resembles the Mi4i! While it is a Xiaomi phone the camera will be one of the key highlights – this again comes with the 13MP camera but this time around its bumped up in terms of power to provide an ultra fast focus at 0.1s and Phase Detection as well. The front camera is a 5MP one with 5 element lens and f/2.2 aperture. The camera is round shaped this time around. The interiors consist of the highly successful MediaTek Helio X10 Octa-core processor clocked at max speed of 2.2 GHz. We have three variants here – first one comes with the Helio clocked at 2.0 GHz and supports just TDD & TD LTE bands, second is the same as first but comes with TDD & FDD LTE bands and the third one is the PRIME that comes with TDD & FDD LTE bands and 2.2 GHz on the Helio. While the first two variants have 2 gigs of RAM and 16GB of internal memory the PRIME has 32GB of internal memory and NONE variants have an option to add additional memory. The battery is slightly bumped up to 3060 mAh battery that supports Quick Charge 2.0 and all the phones are Dual SIM compatible. 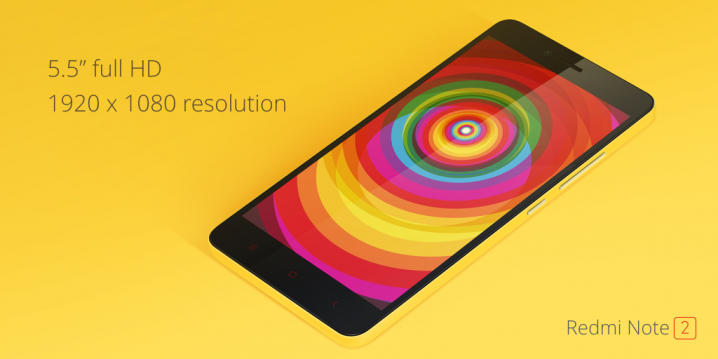 The Redmi Note 2 will run on MIUI 7 built off Android Lollipop which was also launched today. The phone weights 160 gms and is just 8.2mm thick. The other specialty is the fact that the back is no more slippery but matte finished like the one we saw on the Mi4i and comes in a range of colors that include Pink, Blue. Yellow, White and Black/Gray. In terms of the price the 3 variants cost RMB 799, 899 and 999 as this is just for China. There is a special event on the 19th of August in Delhi in India where MIUI 7 will be officially launched again. We hope they will announce the Redmi Note 2 and its pricing for India as well and we believe this spec sheet at this price will smoke out the competition – we will keep you posted!